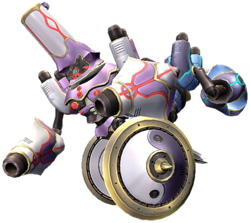 Duon is a boss in the Subspace Emissary of Super Smash Bros. Brawl, where it is located atop the Battleship Halberd Bridge. In the game, it is fought by Fox, Falco, Snake, Lucario, Zelda/Sheik, and Peach. Six Mr. Game & Watches are launched through the glass of the Halberd's control room and land a few feet away from where Zelda, Peach, and Fox stand. They dissolve into Shadow Bugs and quickly reform into the monstrous Duon, which Fox, Zelda, and Peach prepare to battle. Lucario and Snake jump from the control room's window and land behind the three. Falco lands behind the fighters after ejecting from an Arwing as it flies overhead. All the characters work together to defeat Duon. After being defeated, Duon shrinks, and loses all of the shadow bugs that made it so powerful. A lone Mr. Game and Watch trophy lays in its place. With the Mr. Game & Watches gone from the wheel, Meta Knight regains control of the Halberd. Duon later appears in The Great Maze, where it appears at the same area, atop the Halberd's bridge. Its attacks involve spinning rapidly, firing a barrage of missiles, crushing the player by jumping, and shooting lasers in a circular pattern, amongst other attacks. While Duon fires the missiles, the player can move behind Duon. The missiles may hit Duon, dealing damage to it. Duon also appears in Super Smash Bros. Ultimate as a spirit. Wii Super Smash Bros. Brawl A robot with two upper bodies sharing one set of wheels. The blue-bodied half uses sword attacks, while the pink one uses lasers from its head and arms for offensive power. Whichever side is facing you will attack. Duon also threatens with homing missiles and the blade on top of the blue half. The design on Duon's wheels is the Yin-Yang, a symbol that represents balance. In the trophy gallery in Super Smash Bros. Brawl, Duon's name can be spotted from the underside of its trophy. This page was last edited on February 19, 2019, at 14:40.